I’m sure if you have had lessons before, your coach will have mentioned the term club path and perhaps they diagnosed a faulty club path for the error within your swing. But what is club path and how do we change it? “the direction the club head is moving (right or left) at impact and is measured relative to the target line”. An “in-to-out” club path is necessary to hit a draw and an “out-to-in” club path is necessary to hit a fade. The optimal club path depends on the type of shot the golfer wants to play. A golfer may want to hit a 5 yard fade, straight shot, or 10 yard draw. Each of these shots has its own optimal club path. So how can we change club path? Especially if we have a club path that is travelling nowhere near the intended line? Well there are two main ways to do so. The first one is to change the steepness of the club’s decent. In my opinion, this is the least effective way and requires a great deal of skill to be able to do so. The second way and by far the best way in my opinion is to re-align your entire arc/ plane of swing or as TrackMan would call it your swing direction (more to come on that in tomorrows email). The arc of you swing is far more easily adjusted and will allow you to control and adjust your club path at will. So how do you control your arc of swing? 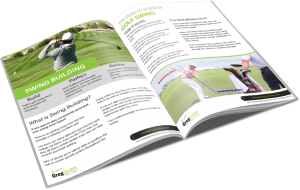 Through practising and achieving your key swing positions. Video your swing, study your swing, review your swing and see if there are variations within the positions. The more consistent you are with your swing positions, the more consistent your club path will be. Achieve more consistency with your golf game What is swing direction?